© Heriberto Rodriguez/TNS Mexico has exactly one gun shop where you can legally buy a firearm, on a military base in Mexico City. The only gun shop in all of Mexico is behind a fortresslike wall on a heavily guarded military base. 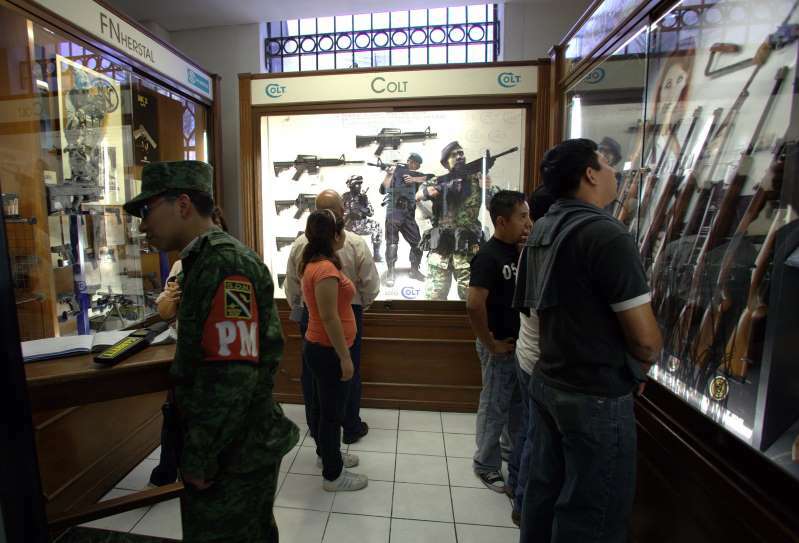 The army-run store on the outskirts of Mexico City embodies the country's cautious approach to firearms, and a visit here illustrates the dramatically different ways two neighboring countries view guns, legally and culturally. Like the Second Amendment in the United States, Mexico's Constitution guarantees the right to bear arms, but it also stipulates that federal law "will determine the cases, conditions, requirements and places" of gun ownership. For many Mexicans, even those who love guns, the thought of an unfettered right to owning one is perplexing. That paradox is increasingly relevant given Mexico's unprecedented level of gun violence, which has claimed more than 100,000 lives over the last decade. Last year was Mexico's deadliest since the government began releasing homicide statistics in 1997. This year, it is on track to surpass that record. American firearms are directly driving the violence, although U.S. appetites for drugs and rampant corruption among Mexican officials also play a role. About 70 percent of guns recovered by Mexican law enforcement officials from 2011 to 2016 were originally purchased from legal gun dealers in the United States, according to the Bureau of Alcohol, Tobacco, Firearms and Explosives. Mexican leaders have long complained about the phenomenon. In 2012, then-President Felipe Calderon erected a giant billboard in the border city of Juarez that spelled out the phrase "No more weapons." The letters, formed using crushed firearms seized by authorities, were visible from Texas. Most trafficked guns are purchased in the U.S. from one of the country's more than 67,000 licensed gun dealers or at gun shows, which unlike stores often do not require buyers to present identification or submit to background checks. By contrast, would-be gun owners in Mexico must offer a birth certificate and proof that they are employed, and have no criminal record. The atmosphere at the directorate is more sterile than a U.S. gun store or pawnshop. There are no moose heads on the wall and no promotional specials. Guns stamped with the army's logo are kept in locked cases and customers aren't given the chance to heft a rifle to their shoulder to see how it feels. The store manager, Col. Eduardo Tellez, said he believes gun ownership is a privilege. He sees his job as making sure firearms end up in the hands of "moral and responsible" people only. "You need protection," Gallegos said. He spent months waiting for his paperwork to be approved, but said he was happy to wait. Proper screening for gun owners is important, said Gallegos, who said he also supports Mexico's ban on heavy assault weapons. "A civilian shouldn't be able to have the same power as the military," he said. "We have such a serious domestic problem that it can be hard to get any oxygen related to international drug trafficking," said Chelsea Parsons, an expert at the Center for American Progress who recently co-wrote a report detailing the impact of American guns on Mexico. The report found that 66 percent of Mexico's homicides were committed with a gun in 2017, up from 15 percent in 1997. In recent months, Mexican leaders have again seized on the issue, in part to counter headlines about the country's spiraling violence and President Trump's complaints that Mexico isn't doing enough to stop the northward flow of migrants and drugs. President Enrique Pena Nieto brought the issue up at a news conference with Trump shortly before the 2016 presidential election, blaming the influx of U.S. firearms for "strengthening the cartels and other criminal organizations that create violence in Mexico." Candidates vying to replace him in Mexico's July 1 presidential race are also using it as a rallying cry. "Instead of threatening walls, instead of threatening to militarize the border, we demand that they stop the flow of arms from the United States to Mexico," Ricardo Anaya of the National Action Party said recently in the violence-ridden border state of Tamaulipas. Front-runner Andres Manuel Lopez Obrador of the National Regeneration Movement has demanded a new investigation into the defunct Fast and Furious program, under which U.S. federal agents allowed guns to be purchased illegally in the hope of tracing them to leaders of Mexican drug cartels. Jose Antonio Meade of the governing Institutional Revolutionary Party, has called for construction of a "technological border" that would detect vehicles crossing into Mexico with guns. Gun control advocates on both sides of the border say Mexican leaders should also push the government to do a better job of ensuring that guns issued to police and soldiers don't fall into the hands of criminals, which many often do. The proposed rule change has long been sought by gun companies eager for easier access to international markets, but advocates worry it could put more guns in the hands of corrupt governments. U.S. Rep. Norma Torres, D-Calif., introduced a bill that would limit the impact of such a change, as well as legislation that would make gun trafficking a federal crime, which it currently is not. Torres said she has not sought to draw attention to her work to stop arms trafficking because she is wary of pushback from gun industry groups such as the National Rifle Assn. "This shouldn't be a controversy," she said in a recent telephone interview. "It should be about how do we help Mexico deal with its violence." "It's something they bring up in every conversation," Torres said. Reducing the flow of guns south, she said, "is something we should do if we care about our relationship with Mexico." Back at the gun store in Mexico City, gun enthusiast Fausto Gerard was helping a friend buy a rifle. Gerard works for a Slovakian gun manufacturer, Grand Power, that sells guns to the Mexican military. He is the silent partner in a gun store in the U.S. He is passionate about bringing the sport of target shooting to Mexico. "It's good to have liberties, but there has to be a mechanism for control," he said. He said he would support even more restrictions, including screening for mental illness among gun buyers. "In Tijuana or Juarez," he said, "it's much easier buying a gun on the black market." World - U.S. Daily News: There is only one gun store in all of Mexico. So why is gun violence soaring?